Nevada casinos hate gambling -- unless it's done at their tables. Now state gambling regulators are taking aim at an increasingly popular form of legal gambling: daily fantasy sports. The Nevada Gaming Control Board ruled Thursday that daily fantasy sports are a form of sports betting. That forced the embattled sites DraftKings and FanDuel to block Nevada residents from playing their games. Ironically, Nevada is the only state where gambling on sports is actually legal. But the Nevada commission ruled that to operate in the state, DraftKings and FanDuel must be licensed by the state to accept sports bets. The sports book at the Mirage casino in Las Vegas. That didn't leave the fantasy sites much choice. Getting a sports book license means they'd be legally classified as sports gambling companies, which are illegal everywhere but Nevada. FanDuel, DraftKings and competitors such as Yahoo (YHOO), CBS and ESPN can operate legally because federal law explicitly exempts fantasy sports from the definition of illegal gambling. Judges have ruled that fantasy sports is a game of skill rather than a game of chance. But it certainly seems like sports betting, since players bet money in the hope of winning prizes based on the outcome of sporting events. Fans choose a virtual team made up of real players, and the teams win or lose based on the players' real-world statistics on the field. 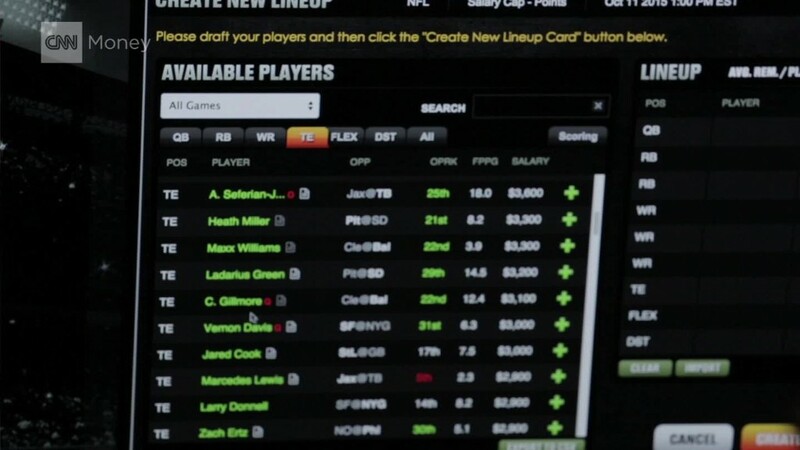 DraftKings and FanDuel have been growing rapidly, paying millions in prizes on many games. 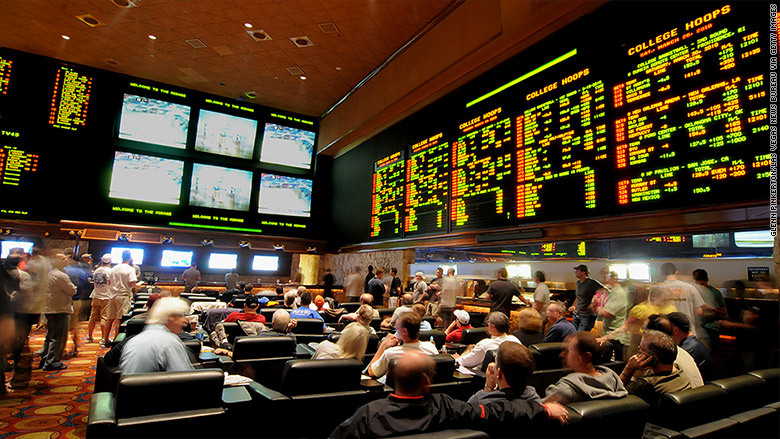 That growth may be hurting Nevada's legal sports gambling business. Football betting there fell 16% last season, according to the most recent report from the Gaming Control Board. Stats for this season are not yet available. Both fantasy sites said they would fight to overturn the decision. "We understand that the gaming industry is important to Nevada and, for that reason, they are taking this exclusionary approach against the increasingly popular fantasy sports industry," said a DraftKings spokesman. "This decision stymies innovation and ignores the fact that fantasy sports is a skill-based entertainment product loved and played by millions of sports fans," said FanDuel. Nevada joins five other states -- Arizona, Iowa, Louisiana, Montana and Washington -- where fantasy sports are illegal. Nevada is also one of only a handful of states in the country where there is no state lottery. The casino industry praised the Nevada ruling, and said it will push to extend it to other states. "The casino gaming industry has repeatedly called for greater legal clarity on daily fantasy sports," said Geoff Freeman, CEO of the American Gaming Association. "We appreciate that the Nevada Gaming Control Board has provided that clarity. We will continue to seek additional clarity in other jurisdictions." The decision comes in the wake of a recent controversy over whether DraftKings and FanDuel employees used inside information to win big playing fantasy games with competitors. The sites have insisted their employees did nothing wrong, but in response to the controversy have banned their employees from playing fantasy sports for money. Law enforcement authorities, including the U.S. Attorney in Boston and the New York Attorney General, have launched probes into their business practices and members of Congress have called for more regulation of fantasy sports. But the controversy has done little to scare away fans who wagered a record amount on football at the sites last weekend.